Heat oven to 375ºF. Line two 15x10x1-inch baking sheets with cooking parchment paper. Unroll well-chilled dough on flat work surface (do not separate). Press all perforations to seal and create one large rectangle of dough. Roll dough sheet out to 14x11-inch rectangle. Cut vertically to make two 11x7-inch rectangles. Cut crosswise into total of 44 (7x1/2-inch) strips. Pat sausages dry with paper towels. 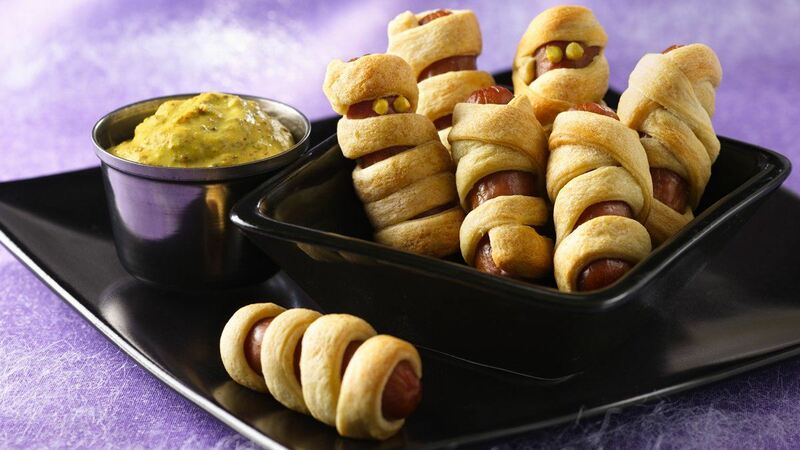 Wrap 1 strip of dough around each sausage to look like a little mummy; press firmly at each end to secure. Place on cookie sheet 2 inches apart for even browning. Bake 15 to 20 minutes or until golden brown. Meanwhile, in small bowl, mix mustard and oregano. Serve sausages warm with mustard dip. Short On Time? : Skip making the dip and serve with ketchup and/or regular mustard.